Our Electrolysis Enhancer powder is the same formula Enagic uses for their liquid versions. Simply pour the powder in your machines electrolysis enhancer reservoir and fill with water. Each packet of powder will refill your electrolysis enhancer reservoir. Since we opened for business in 2009 we've sold over 300,000 packets of Electrolysis Enhancer worldwide! We are not affiliated with Enagic. We do not compete with Enagic distributors. 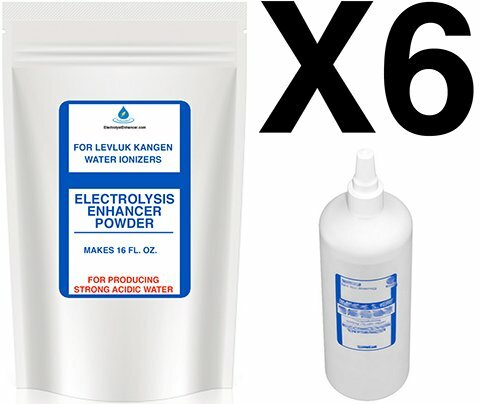 Electrolysis Enhancer for the LevLuk / Kangen series of water ionizers. If you have any questions about this product by ElectrolysisEnhancer.com, contact us by completing and submitting the form below. If you are looking for a specif part number, please include it with your message.